Since moving to San Francisco, I have enjoyed visiting the mercados (Latin markets) in my neighborhood. Not only is the produce cheap and plentiful, I can also buy cotija cheese by the wedge, crema and a variety of other Latin products that are fun for a gringa like me to experiment with in the privacy of my own kitchen. This salad was inspired by a trip to a mercado; we eat it as an entreé salad, mounded high on our plates. Heat honey, tequila and sugar in a medium-sized sauce pan over medium heat until the mixture has reduced by half. Pound garlic and salt with mortar and pestle until a paste forms. Put tequila mixture and garlic paste in the blender. Add cilantro and blend until cilantro has been incorporated. Continue to blend on medium speed while slowly drizzling olive oil into blender. Blend until emulsified and slightly creamy. Add vinegar, hot sauce, cumin, and cayenne. Season with salt and pepper. Prepare lettuce. 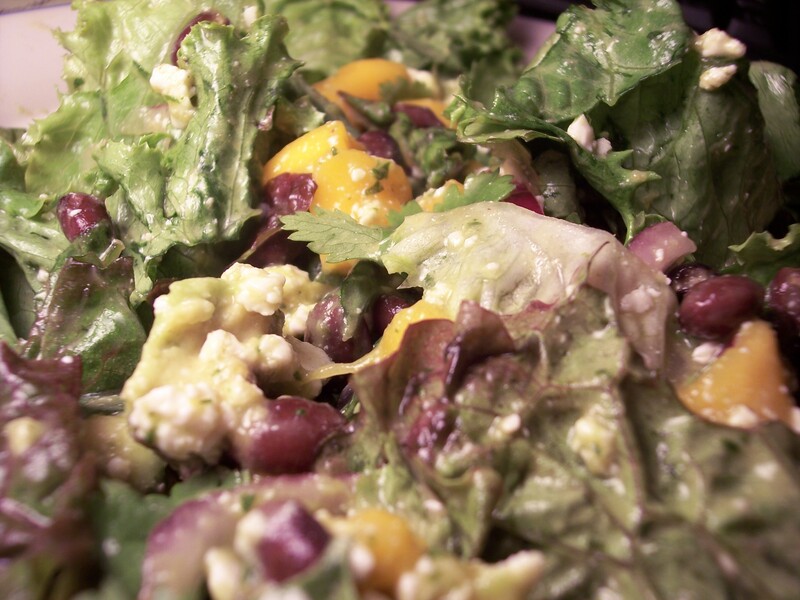 Toss lettuce with vinaigrette and cilantro in large salad bowl. Mound lettuce on 4 large plates. Divide all ingredients between each salad. First place beans on lettuce. Then mango and onion. Top with avocado, cheese and cilantro garnish.